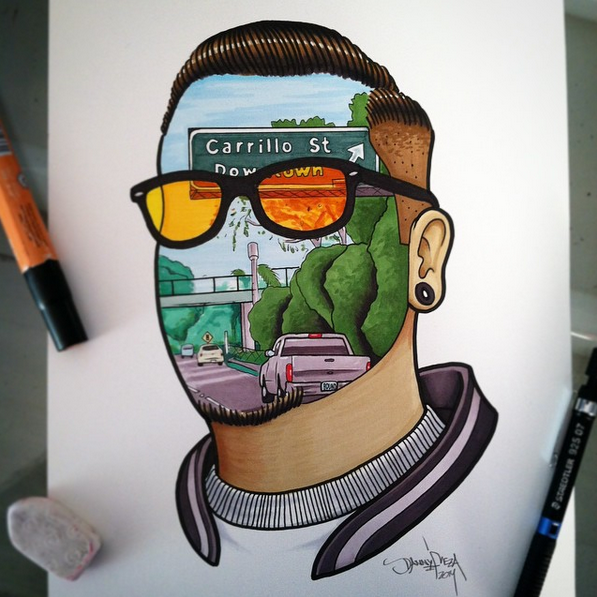 Danny is from Santa Barbara, CA . For as long as he can remember he has been creating art. Influenced by skateboard graphics, comic books and graffiti, he has created his own unique style. Growing up in his hometown of Santa Barbara, Danny experimented with multiple mediums, ranging from markers to oil paint. After graduating High School, he attended The Art Institute of CA – Los Angeles, where he received an education in Graphic Design. He later returned to Santa Barbara, where he worked on various mural projects including one large scale project that lead him to a tattoo apprenticeship. For the past few years he has being applying his graphic design skills along with illustrative background to create a unique twist to his tattoo body art. He has also been working for the City of Santa Barbara as a Youth Mentor where he worked with High School students to educate, make art and paint murals around the City.